APANAMA: WHY Maybank is pumping up AirAsia X ? Maybank Investment Bank Bhd (MIBB) helped prop up AirAsia X's shares by pumping in more than RM20 million to defend the shares from falling. The bottom position still rests with Malaysia's second special-purpose acquisition company CLIQ Energy Bhd which closed below its IPO price of 62.5 sen in April this year. Prior to the share sale, AirAsia X had hired MIBB, a unit of the country's top bank Malayan Banking Bhd, to act as market stabiliser. SIX DAYS later we have Maybank Investment Bank Berhad and AirAsia X in the news again. So, Maybank has 'pumped in' a total of RM28.45m to pump up AirAsia X. Why is this so? Is this how BIG businesses are carried out nowadays? The earlier BT reports said " AirAsia X raised RM987.7 million from the IPO, of which nearly RM240 million went into the pockets of some its key shareholders, including its founder Tan Sri Tony Fernandes. Who is pocketing what and why is MayBank involved in this deal, it appears dubious to me, in the first place. It may just be a coincidence but the current CEO of Maybank Investment Bank Berhad is Tengku Zafrul Aziz. Do you know that he used to be (not sure if he still is) the great Tony Fernandes' business partner? 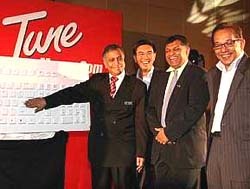 What they did to MAS and the soothing tunes they were singing, even to the Prime Minister, before the MAS-AirAsia share SUAP went bust is a fine yet glaring example of what some morons who come wrapped in designer suits are capable of. Excuse me, are we taking Maybank for a ride now? Why is there a need for Maybank to pump in million of ringgit to pump up AirAsia X when the BT report said (6days ago) that the key shareholder have already filled their pockets from the listing. I thought The Star's B.K.Sidhu had predicted that AirAsia X IPO would be oversubscribed by 3 or 4 times. Apa sudah jadi? Is this not market manipulation or attempts to hoodwink investors into believing blatant fabrication and lies? BK Siddhu said a source told her. She must be working in concert with manipulator. Let's not blame the messenger but sometimes messenger can be in cohort. Just like SN Lock used his cahrts to support shares and The Star's PY Chin used to rig shares with his sories of rumours from undisclose sources. Come to think of it,air asia shares might not have what we called intrinsic that can attract the investor.otherwise the price could be a premium.Anyway I do not want to be naughty to make unsubtantiated claim. But you must agree,that now every one can fly.otherwisw flying will only become the passion for the rich. give them the chance please.